The riders were near EDSA Crossing, the corner of Shaw Boulevard and the country’s main thoroughfare which is notorious for being one of the worst chokepoints in Metro Manila due to the number of buses in the area. CNN Philippines television host and road safety advocate James Deakin shared the video of the motorcycle riders on his Facebook page. Filipinos were generally amused at the video but there were those who admired the riders for keeping their cool in the midst of traffic. EDSA is the most popular thoroughfare in Metro Manila that suffers from regular congestion, especially during rush hour. 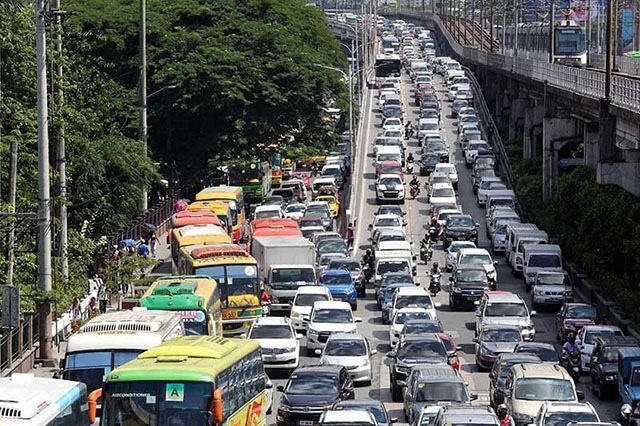 The highway has been suffering from traffic since the late ’80s, when different malls, residential subdivisions and office buildings had started to emerge along Quezon City, Ortigas, Mandaluyong and Makati, among others. “Correct urban planning was set aside to accommodate real estate developers and commercial property owners. This brought about the end of inter-city planning,” an article from the automobile magazine noted. “Officials and businessmen, including city engineers, closed their eyes to try to forget the correlation between street capacity, population and vehicle density,” it continued. The government built several flyovers and underpasses to alleviate traffic, as well as construct the Metro Rail Transit System. However, people continued to flock in Manila as it became a political, economic and cultural center. In 2017, it was revealed that the city has the third worst traffic in Southeast Asia, based on a study done by global firm Boston Consulting Group. On average, travelers would spend more than an hour on the road every day. Bangkok, Thailand came in first with 72 minutes of travel time while Jakarta, Indonesia came as second with 68 minutes.